Introducing the Chocolate Orange Cake. Let's start with a few VERY SWEET words about this amazing recipe. "This chocolate orange cake is out of control!!!!! I don't even like chocolate and orange and almost ate the entire huge slice. WOW!! !....Well done... as usual." The most wonderful thing about this chocolate layer cake is how easy it is to prepare. Not to mention the rich and powerful flavor sensation. Place all the ingredients into a bowl and mix it. Pour the ingredients into pans, bake it for about 20 minutes and like magic you have an exquisite torte. A.K.A Dump Cake, which does not sound so exquisite at all. But trust me when I say it is dreamy. Please watch this short video first on how to prepare your cake pans. 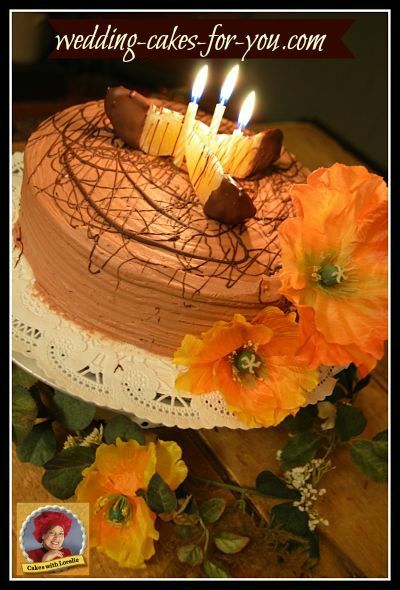 "I just wanted to write to you to thank you for your recipe of the chocolate orange cake. It was absolutely amazing and possibly the best cake I have ever tasted! I can't thank you enough." The recipe is written below. This cake recipe is a prize winner! 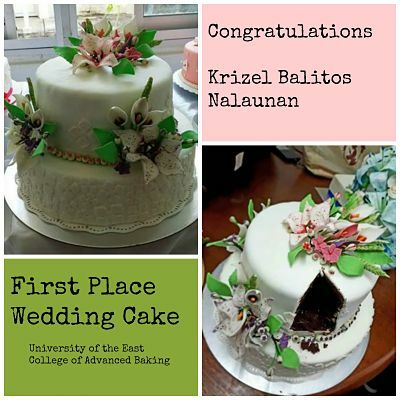 Krizel won first place in her final exam. She used this amazing recipe but replaced the cake flour with all purpose to create her prize winning wedding cake. "Thank you for the recipes and suggestions. I did it and I'm the best in wedding cake in my class"
Listed are the ingredients for this delicious cake. Please follow the video for directions and for the filling and frosting that goes with it so perfectly. Sift the dry ingredients together by stirring them all together with your mixer on low speed. Add the milk, oil, vanilla,zest and eggs.. Increase the mixer speed to medium and beat for 2 minutes. Scrape the bowl with a spatula and mix for a few more seconds. mix together the juice and boiling water with the melted chocolate. Add it to the mixture and mix on low until blended. Fill your prepared pans. Place the pans into a 400 degree oven and bake for 15 - 20 minutes or until the tops spring back when touched. 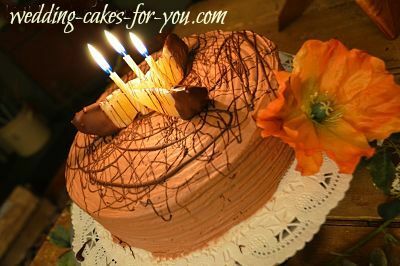 Included in the video instruction is a light chocolate orange birthday cake icing that pairs well with the dark rich layers. Vanilla buttercream is a great choice. Vanilla is a nice contrast. Decorate the top of with raspberries or use them in the filling with the icing or cream. Dip orange or Clementine slices in melted semi sweet chocolate. Drizzle melted chocolate with a fork onto the top like I did in the video. It makes for a nice presentation and added richness. This cake has a sophisticated flavor for an adult party, but kids would love it as well. I n the video I made a two layer cake with 9 inch pans but if you use 8 inch pans you can make three layers of lusciousness. Feel free to use this as a wedding cake or for any special occasion. You will have to multiply the recipe many times for a wedding cake but I think it would be well worth the effort. ﻿I hope you like this rich chocolate cake recipe as much as I do. It's a great addition to your repertoire and you can use it for any occasion.Thanks for visiting my website and please let me know what you think or what you would like to see.